Sneak and Show has had a strong presence lately in Legacy. 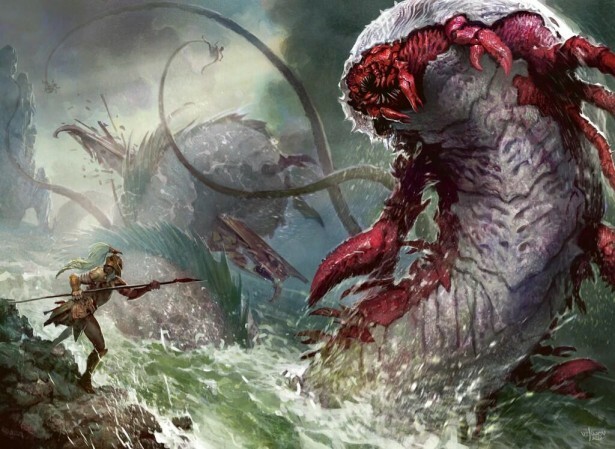 Emrakul, the Aeons Torn and Griselbrand are two of the most explosive creatures you can surprise your opponent with. They both generate massive card advantage while throwing a lot of damage through the air. Typically the deck wants to bring them out with a quick Show and Tell. Sneak Attack gives the deck another method of hurling Demons and Eldrazi at your opponents. I don’t see the price coming down unless a ban of one of the above mentioned cards occurs. What surprised me was that the Judge Promo is only $75. There is no way the two should be so close in price. I would try to get my hands on the Promo before it jumps past $100. I will be honest. I had to look this one up to see what it did. It is an uncommon from Odyssey. It sends a strong signal to your opponents not to play instants (like Counterspells) or cards with Flash (like Vendilion Clique or Snapcaster Mage) on your turn. I could see it being useful if your friends have been getting too cute during multiplayer games. I just don’t see any decklists or chatter to justify the sudden spike in price. I smell a buyout. Sometimes it is hard to remember that standard can have an impact in the financial side of Magic. Jarad has been used alongside Scavenging Ooze, Lifebane Zombie and Herald of Torment to great effect in Goglari Dredge. The upcoming printing of Temple of Malady will only help the archetype. Jarad has been printed in a Duel Deck and is set to rotate at the end of the summer, so I would be surprised to even see him get to $4. His price ceiling is just too close to his current price. Another week and another spike/plummet for Silent-Blade Oni. This swing was smaller than last time. It is possible that it is stabilizing. I would not buy into this card at this price. I think right around $7 seems about right. It is nearly impossible to reprint outside of a supplemental product and the effect has dramatic potential. In the long term I see this as a slow grower if you can stomach all of the turbulence. It seems as though Commander players just cannot get enough of Nekusar, the Mindrazer. Unlike most of the cards that have been spiking from Nekusar, this does not force others to draw cards. Instead it constrains their mana or amplifies their life loss. If you have Nekusar out then you do not need to worry about your mana. You are probably already winning. Your opponents will be bleeding to death or have their hands tied. It was a rare that was only printed in Planeshift so supply is pretty meager. I doubt it will continue at this rate but I don’t think it is coming back down. I would trade for these. Like King Midas, everything that Nekusar, the Mindrazer touches turns to gold. Even a seemingly harmless artifact has nearly tripled in value since his printing. It has had five printings so the supply is ready to soak up the increased demand, but I feel that the price will hold. With economic power like this, I can’t believe that Otherworld Atlas is still less than fifty cents. Here is the power of casual demand. This is a solid creature who screams card advantage. She is a powerful Commander and has even seen play in Legacy BUG Nic Fit. She is only available in the original Commander products. The explosion of the format and the number of Magic players has led to her nearly doubling in price. I don’t see her maintaining that in the short term. I think she will come back down to $10 and sit there quietly growing until she is reprinted in another Supplemental Product. This card is doing surprisingly well considering it is a common that has seen four printings and is currently banned in Modern. This means that the only interest is from Vintage and Legacy. Fortunately Legacy loves its one mana cantrips. Legacy players also invest enough in their decks to get the premier versions of each card. It is not only pretty. It is powerful. It can set up powerful Miracle cards lime Terminus and Entreat the Angels or help you flip your Delver of Secrets. I like textless Ponder as a long term hold. It would look at other textless cards that see play in eternal formats for potential. Lightning Helix is still holding at $10. Pyroclasm and Day of Judgment are under $4 and they are both used in numerous Modern and Legacy decks! There may be some opportunities there. There have been a few attempts at Azorius Control and Mono-White Prison decks in Modern. Hiding behind a bevy of enchantments like Ghostly Prison, Runed Halo and Detention Sphere allows the deck to play defense while building up a flying army. Every Constellation card and god from Journey into Nyx that gets previewed only heats up the excitement. I would try to trade for these. Once Modern season gets started this could see $8 or even $10 if the rest of the deck lines up. What a difference a day makes! It soared from $3 to $13 and is on its back to settling around $5 to $6. You may even have a few in your junk rare binder. It is used as a one of in Mono White Control and Prison style decks to allow you to hit your land drops while drawing spells each turn. Once you have the four mana to cast it, you can play almost everything else in the deck. The deck does run Sigil of the Empty Throne and Sphere of Safety, so hopefully you can keep it for at least one turn to get that last Plains you need. After that it is gravy. You are almost guaranteed to draw fuel for the rest of the game. I think this was pretty much just a quick buyout. The card was a rare from Eventide which was not a widely opened set, but it is not a linchpin for the deck. I would get out while you can. This one seemingly came out of nowhere, but it is interesting. Maelstrom Wanderer is one of only four RUG Commanders, and it is one of the most powerful. The double Cascade and Haste it grants means it almost always has an immediate and impressive presence on the board. It is only available in two printings: Planechase 2012 and Commander’s Arsenal. Copies are not easy to get a hold of due to the limited printing of both products. Several of the Commanders from the first round of Commander decks and Planechase decks are getting some attention in the market right now. I don’t think Maelstrom Wanderer will be able to retain this price for long. I see it settling around $15. There are still several other Commanders from these sets with room to grow like Riku of Two Reflections, The Mimeoplasm, Ghave, Guru of Spores and Karador, Ghost Chieftan. Let us all take a second to bask in the irony of the God of Victory being listed among the Losers of the Week. Not many cards retain their Pre-Order price. This is the cold truth of preview season. There will be a lot of excitement and hype. Some cards will be all-stars. Some will be flops. I don’t think that Iroas will be either. He is a powerful card and I would not mind opening him up at the Prerelease. I just think that as further preview cards appear that prices are adjusted accordingly. I still think he is a little overpriced and will probably settle with some of the other gods in the $7 to $8 range. Speaking of which, Karametra, God of Harvests is still available for under $3! She may not see a lot of play right now, but as a god and potential Commander she is sure to have long term casual appeal. Weren’t we just talking about how great the Commander Legends are doing? I still count Animar among their number. It is possible to do truly degenerate things with it. The problem is that it tried to jump too high, too quickly for a card whose entire price is propped up by Casual players. It went from $8 to nearly $20 overnight. It was a classic buyout. It is recovering but I would not hesitate on any copies that you could find for $10 or less. This card is still a powerful deterrent in Modern and Legacy. A month ago this was a $15 card. I think that the jump to $24 was a little too aggressive. It has come down a bit, but I think it will hold steady at $20. Don’t sell in panic. This rare from Legends is used in 12 Post, Lands and Junk Depths. Even when it is used, there is only one copy in the deck. The big problem is that these decks are not showing up in the Top 8 of any major tournaments. Top 16 is good but not quite the same. It is on the restricted list so there are only so many copies and there will never be any others. I still think $700 was a little ambitious. However, if you wanted to get your Tabernacle for under $600 then this is your lucky day. I don’t see it dropping further and may even possible recover. I would buy now if you are planning on using it in a deck but otherwise $550 is a lot of capital to tie up in a card that is probably going to bounce back $100. There are better returns for your investing money. This is even more interesting than it looks at first blush. It was hovering around $20 for a while. It dipped to $14 on its way to $50. This week it dipped back down to $30 and has already recovered to $40. It is looking for a new floor. This card sees a lot of play in Legacy decks like ANT, Sneak and Show, Imperial Painter and Oops! All Spells! Its power and versatility tell me that this it is going to keep its price. Try to snag them when you see dips. will come across people. Let everyone help choose the perfect campsite to your family.